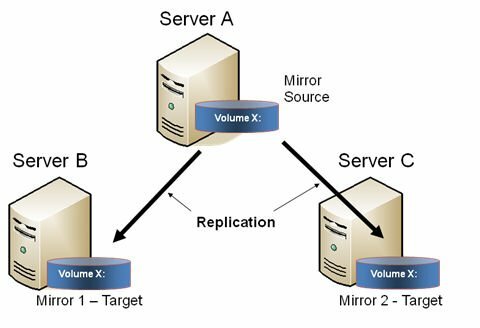 Note that there are two separate mirrors and Server A is replicating to two different target volumes. Administrator initiates a switchover to Server B via the Switchover Mirror option in the DataKeeper UI. Server A flushes its data to the source volume. Mirror 1 is automatically deleted and recreated from Server B to Server A. Administrator initiates a switchover to Server B via the “Switchover Mirror” option in the DataKeeper UI. 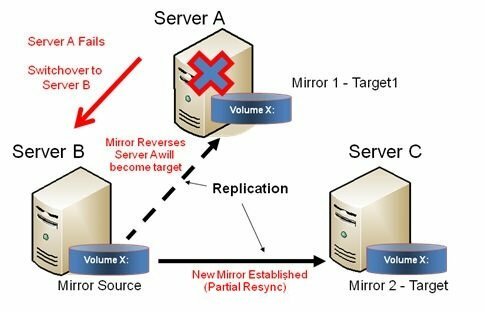 Server B deletes the local side of the mirror and creates a new mirror from Server B to Server A. The mirror between Server A and Server C is deleted. 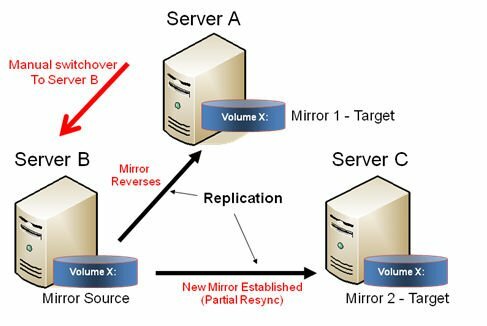 A new mirror is established between Server B and Server C.
When Server A comes back up, Server A detects that Server B became the source of the mirror while Server A was down and Server A automatically becomes the target of the mirror.